A spreadsheet was posted here that contains the details of the discount window lending that was done by the Federal Reserve during the financial crisis. I took the spreadsheet and used it to determine the amount of credit that was extended by the FED at the end of every day. I took every loan in the spreadsheet and assumed it was open until maturity. I then used that data to calculate how much credit was extended by the FED at the close of each day. At the peak, the FED extended over $700 billion in short term loans. Most of the short term loan facilities closed out around the May, 2009 timeframe. At that point the FED realized there was no market for all the junk paper floating around (mainly mortgage-backed securities) so the FED became the sole buyer of all the junk at face value. Short term loans were no longer going to cut it. 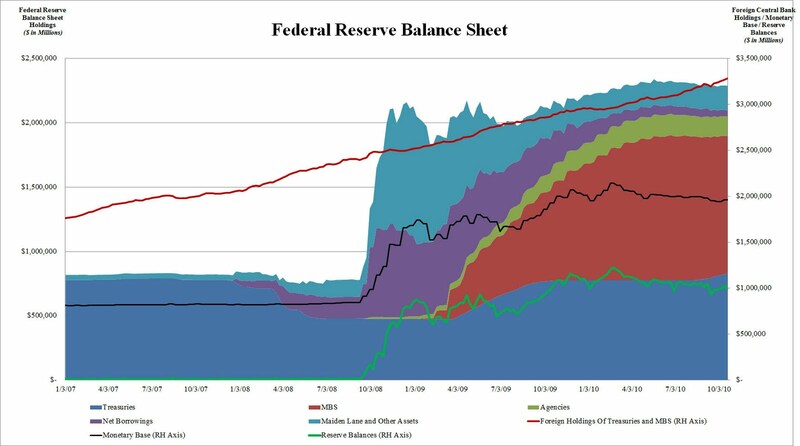 The chart below shows the FED's balance sheet (obtained here). Please note that the chart above does not have the same date range as the chart below. Notice that around the May, 2009 timeframe the FED starts to begin its massive purchase of MBS's for permanent ownership at the FED. I wish I had a guaranteed buyer for all my poor investments.